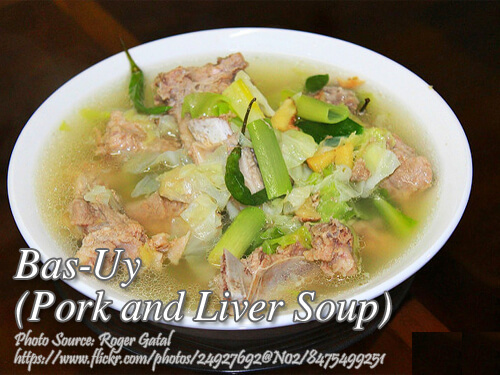 This pork recipe is a soup dish composed mainly of pork meat, pork liver, upo, patola and lemon grass. There are varieties of this dish and they vary on the kinds of vegetables used probably it depends on what region it is cooked. This dish is popular in the Visayas particularly in Iloilo and some parts of the southern region. Cooking this dish is very easy and straight forward because you only need to boil the ingredients until they are cooked. It is best eaten as a viand withe steamed rice and fried dried fish. To cook Bas-Uy; Place liver and pork in a saucepan. Add water, salt, garlic and bring to a boil. When meat is tender, add upo, patola, onion, tomatoes and ginger. Cook for 5 minutes. Add ginger leaf and tanglad and cook for another 5 minutes. Place liver and pork in a saucepan. Add water, salt, garlic and bring to a boil. When meat is tender, add upo, patola, onion, tomatoes and ginger. Cook for 5 minutes. Add ginger leaf and tanglad and cook for another 5 minutes.